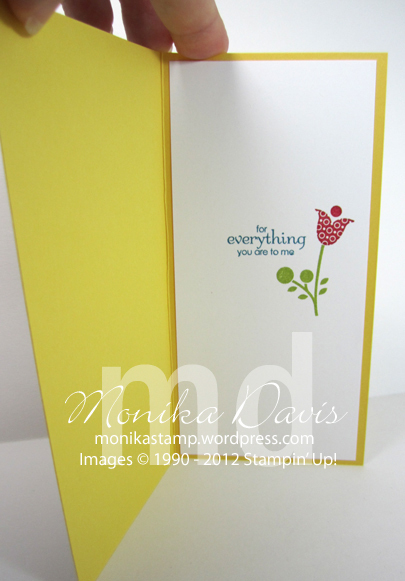 Well it’s the final project for my Stampin’ Up! Artisan Design Team Entry. My last 3D project – this was the “big one”. 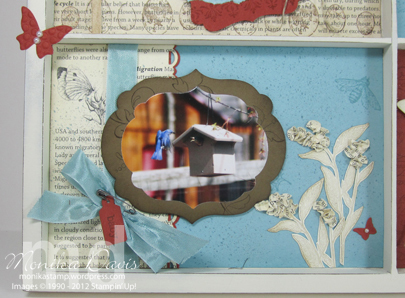 It is a Baby Keepsake Shadow Box. This is supposed to be the WOW project that made them say “Oh – this needs to be a finalist”. Well as you know that didn’t happen. But it is still a wow project and I hope you like it. There are lot of things going on in this project. The background/inside of the shadow box was designed with My Digital Studio and printed through the professional print service multiple times (some are regular and others were heavy weight. The duplicate sheets were cut to create the crib and shelf. The crib I carefully cut out in between the slats for the front and the sides and then glued it together to make a 3dimensional crib. I also created some owls in My Digital Studio and printed them on iron-on transfer sheets then ironed them on a small baby washcloth – there is one on all 4 corners. The boxes are wrapped in Designer Series paper and then I added the letters and randomly added white Baker’s Twine and pearls to some of them. The punched owls are set on the shelf. And then I made a mobile that hangs from the ceiling using the spinner hands, baker’s twine and the little hearts. 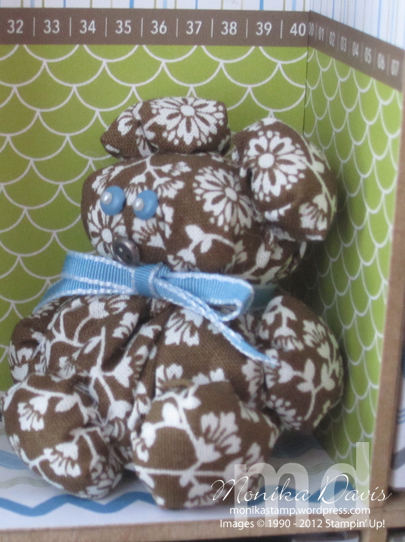 In the corner is a little bear made with the fabric and the circles and brads for the eyes. With ribbon around the neck. I actually hand sewed it all. This is probably my least favorite part of this project. The eyes have pearls on them. Inside the drawers I tucked a few things – for two of them I made little boxes to hold “1st tooth” and “lock of hair”. And then I had baby mittens and a baby wash cloth inside a couple. If I were really using it then they would all get filled up. Around the outside I wrapped with a piece of the wide striped ribbon. There is a lot to see. I am hoping it is on display for everyone to see at convention. Today is check-in day. We just had a great two days stamping and having fun with friends at the Starz Retreat. I’ll tell you more about that later. Oh and we went to the Copper Mine today – that was really neat. It’s time to go check-in and get our convention bags. We have a busy day – see you later. 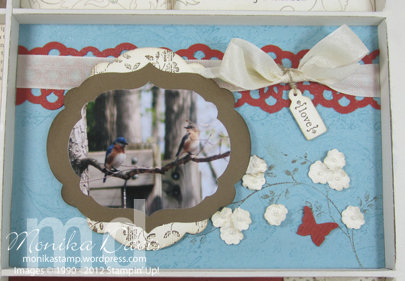 My third scrapbook page for the Stampin’ Up! Design Team contest entry is my Snail page. 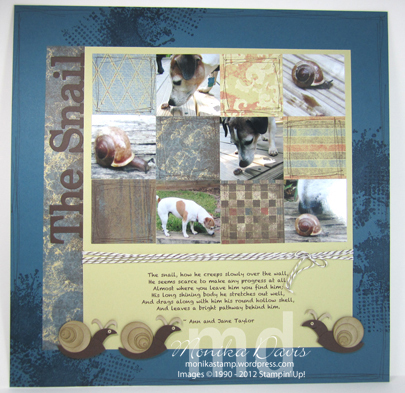 I created some punch art snails last year for a card project and I really wanted to put them on a scrapbook page. And this was what I ended up with. The pictures are Aspen and Magnolia checking out a snail that I found in the backyard. I’m also participating in a Punch Art Swap at convention and mine is this snail. I made 50 swaps – that is a lot of pieces. 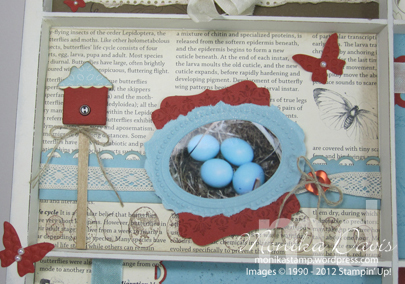 I love this Well Worn Designer Series paper that was in the last catalog and the Extreme Elements sets. They both suited this scrapbook page. Convention check-in starts tomorrow. Today I am at the Starz team retreat and we have been stamping projects for 2 days! 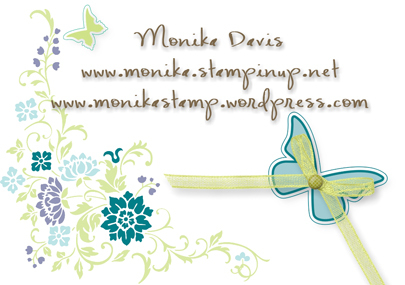 This should be card number 5 from my Stampin’ Up! Artisan Design Team entry. And it was literally the very last thing I made before I mailed my entry in. In fact I had a different card ready to go and then when I was preparing for my scrapbook class that week this idea crept in and I made it in the morning right before mailing in my entry. My creative juices sometimes flow better at the last minute…. I like how this card turned out fun and bright. This one is 6×3 that I submitted to the contest. I made some more of these as 5-1/2 x 4-1/4 cards for my Starz team swap today. There are 3 columns of squares on those instead of 2 columns like this one. I came up with the cross-stitch idea one night while working on a scrapbook page – I realized the ribbon border punch made the perfect base to pull the Baker’s Twine through for a cross-stitch effect. The colors are bright in the Summer Smooch Designer Paper – Daffodil Delight, Real Red, Lucky Limeade, Island Indigo – there are a few more in there but those were the main ones that I used. Here is a view of the inside of the card. 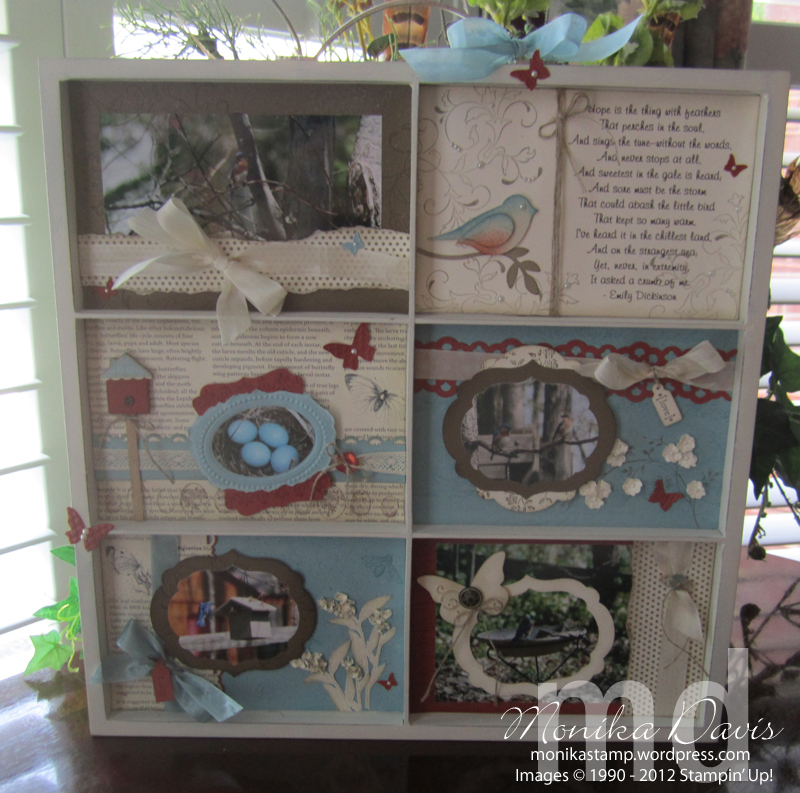 Posted in Almost Artisan, Cards, Designer Series Paper, Thank You	| Tagged Designer Series Paper, Monika Davis, Stampin' Up! 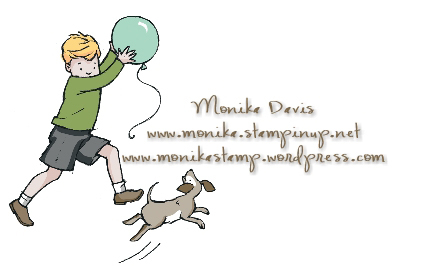 This is my 4th card entry for the the Stampin’ Up! 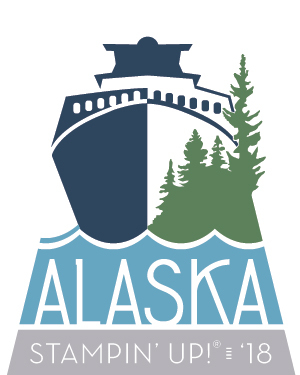 Artisan Design team contest. I really love how this one turned out. 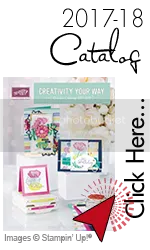 For the Crumb Cake layer I did double embossing – first I embossed with the Stripes Embossing Folder and the Big Shot and then I embossed it a second time using the Tulip Frame Embossing Folder. The stripes are still there but they are more subtle. I sponges over the embossing for a vintage look. 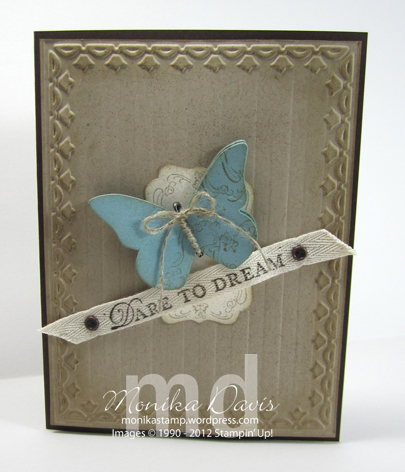 I stamped “Dare to Dream” on a piece of the twill tape and attached it to the card with some of the little brads in the Vintage Trinkets. 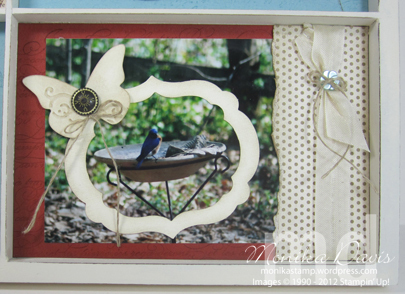 My favorite part is the butterfly – I cut the butterfly with my Big Shot – stamped and sponged it. Then added the body – which is the little safety pin from the Vintage Trinkets and it is wrapped with Linen Thread and then attached around the butterfly. Really pretty results – I thought. But not a finalist selection. I’ll look for it on display at convention though. Let me know if you see it there. I’ll be on my way to Salt Lake City shortly – I am going early to spend some time with my upline, Wendy and other friends that are on her team. I can’t wait! 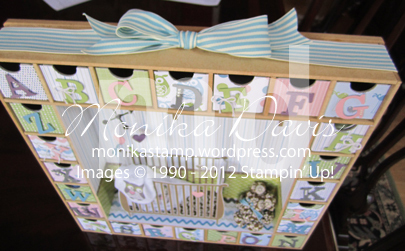 Posted in Almost Artisan, Big Shot, Cards, Vintage	| Tagged Big Shot, Monika Davis, Stampin' Up! I wanted to finish sharing my Stampin’ Up! Artisan Design Team entries with you. Since I wasn’t selected as a finalist hopefully they will at least be on display at convention. But since you can’t see who created the display items I thought I better finish sharing them here. This is one of my 3D projects. 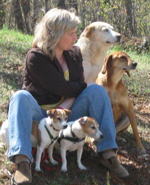 Every spring I love to watch the birds in my backyard – they search for places to build their nests, decide on a house, build the nest, lay their eggs and raise their babies. In fact I just had a family of bluebirds – with 3 eggs and I think just in the last day or two the babies have fledged (left the nest). Anyway I try to take pictures through out the spring of the progress and decided to use those photosas the inspiration for this project. I used one of the popular sectioned frames (I’m not sure what they really call it) and created a collage type project with various pictures and elements. Here are some close ups of each section. Each section has different elements. The colors are Baja Breeze, Cajun Craze, Soft Suede, and Very Vanilla. Do you like my new little signature? I thought it looked just like one of my boys (when they were younger) playing with one of the dogs. Today is actually Ryan’s birthday – my baby is 16 years old! Oh my! Happy Birthday to my sweet Ryan! 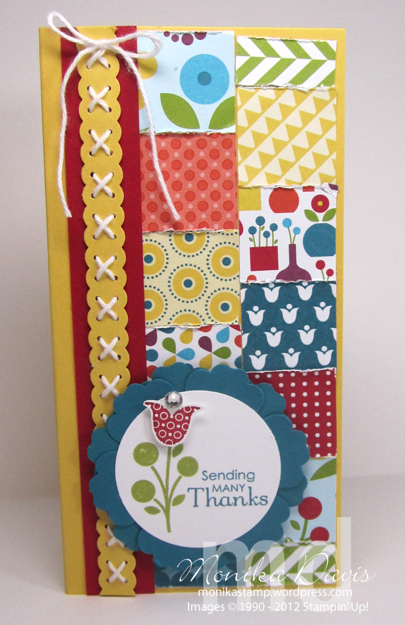 I’m back today with another card from my Stampin’ Up! Artisan Design Team entry. 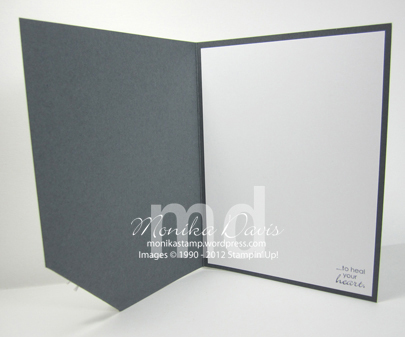 I saw this idea somewhere in my browsing – where the corner of the card front was folded up. 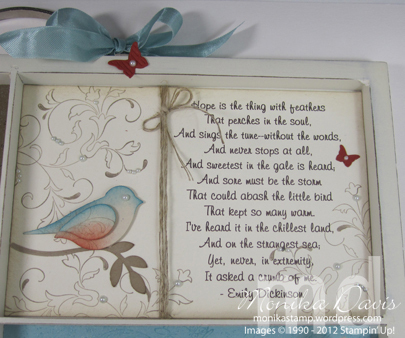 I thought this would be a perfect idea for our stamp set Petite Pairs – it has sentiments that are split into pairs. I think it is a winner – clean and simple with a little twist to it. There isn’t anything I would change. We will be making this tonight at stamp club. 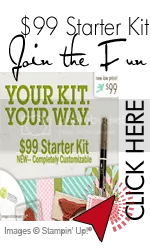 I’ll be leaving for Salt Lake City in only 9 days – I’m going first to see my upline Wendy for a couple of days of stamping fun and then to convention for the rest of the week. I can’t wait – it is going to be so fun. I’m working on swaps and stuff for that. I’m also working on the ribbon shares – the In-color ribbon is packaged and the 1/4″ ribbon is all cut and I’m working on packaging it. 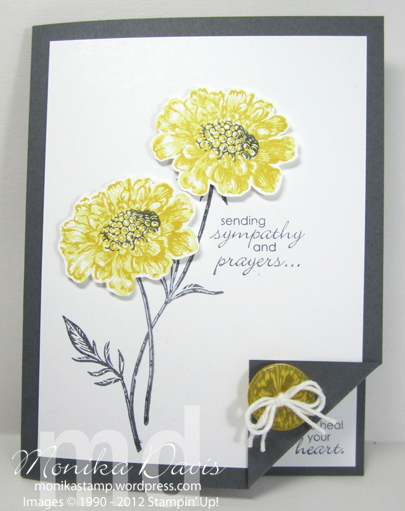 Posted in Almost Artisan, Cards, SU Buttons, sympathy	| Tagged buttons, Monika Davis, Stampin' Up! I have a few final thank you’s to get out from orders that I had in the last couple of days of June – thank you to Sabrina and Molly. I keep checking back at my reports to make sure it is still there. And now I’m wondering what happens and what to expect on the trip. I guess I will learn that soon. The Getaway trip is at the end of September to a resort on Hilton Head Island. Today’s share is another project that I entered in the Artisan Design Team contest. This is my second scrapbook page – this one is an 8×8 page and features a picture of my boys that I took at Easter this year. They were being silly together and it really makes me happy when they are together and having fun and laughing with each other. The edges of the page are actually stamped with the French Foliage stamp set in various colors and also swiped with the ink pad. I added the three little pool party hearts – one for each of my three boys – there are also three little butterflies that represents each of them flying off in their own directions. As they get older they are finding themselves and where they fit in the world. I did the main journaling on the computer but used my own handwriting for the date and the little quote – maybe that was a bad idea – I don’t have good hand writing and it isn’t very straight and even. I really like this page and the picture of the boys. I need to make another one so I can frame and hang it in my craft room. 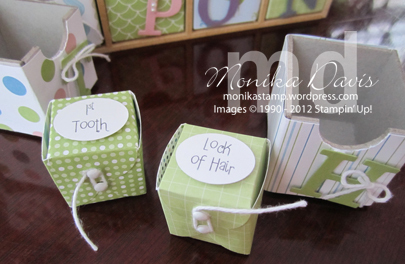 That is the downside of this contest is making projects your love and giving them to Stampin’ Up! and not getting them back. Have a good day today! It’s a little cooler here than it was this breaking – we had two record breaking days at 106 degrees – the highest ever. Today its only 99. Stay cool. 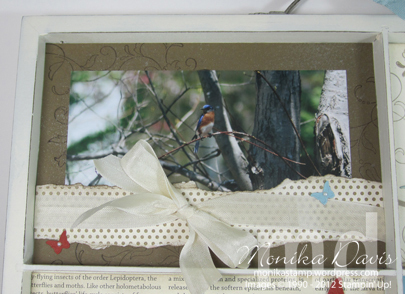 Posted in Almost Artisan, family, Scrapbook Pages	| Tagged Monika Davis, Scrapbook, Stampin' Up!